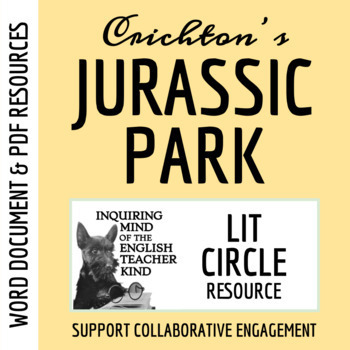 This editable literature circle resource promotes active reading of Jurassic Park by Michael Crichton. Students will participate in thoughtful, collaborative discussions about plot and topics such as ethical concerns brought on by technological advancements, the struggle for control, consumerism, and the value of independent thinking. Through these discussions, students will pose and respond to questions relating to broad topics and character development, demonstrating an ability to analyze how complex characters transform and advance the plot and themes by applying logic and citing compelling, meaningful textual evidence. They will also evaluate their peers' reasoning and use of rhetoric to advance claims, clarifying or challenging unclear ideas. Using this literature circle resource for structured guidance, students, ultimately, will present information, conclusions, and supporting textual evidence clearly, concisely, and appropriately, thereby helping their peers -- and teacher -- comprehend their thinking. Available in Word Document, Google Document, and PDF formats, the entire resource may be previewed by clicking the "Preview" button under the product thumbnail. A "Literature Circle Responsibilities" handout, defining each individual role a student will assume over the course of the novel. Roles include discussion director, connector, literary luminary, and illustrator. One documentation log per role. A rubric for evaluation tailored to individual roles.